Same kit as 2001 'cept crest. Exactly, Greg. That's the first thing that came to mind after I posted. But as themes go, I think I really like the white home kit. I'd be happy with tasteful variations on that going forward. Finally out of the awful stripey shirts. Always reminded me of Where's Waldo. Those legs are all wrong -- the left one barely looks connected to the body. 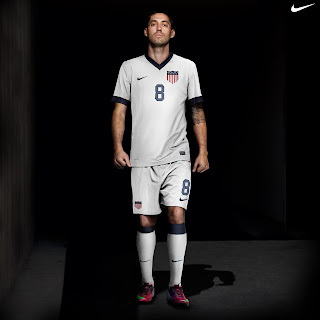 Why the photoshop, USSF? Also, Greg, any comments on Howard's injury? Is it enough to keep him out of the Honduras and Mexico games?